What will probably be the last Saybrook Specials of the season are happening this weekend, and I was down at the crossing this morning to capture it. This one was a bit different in that it had to Stop & Protect due to a broken crossing gate. Made for a lot of stack talk as she started back north - Enjoy! One of the great things about this hobby is that there is such a variety of different things to do that you can just about always find something that you're actually in the mood to do. Makes for a very enjoyable - not to mention productive - hobby. 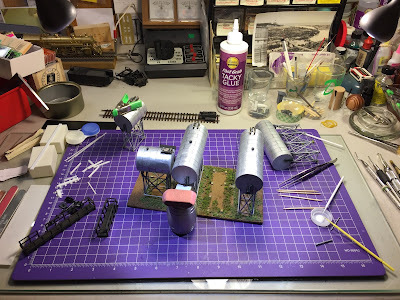 So after posting prototype info and photos on the B&O class P-11 flatcar I'm modeling, the kit took a back seat while I did some decoder installs and finished the Valley Coal tank farm "kit" I got from my friend Dave Messer. But it was high-time to get back to it. . . I think I mentioned that I won't bother with underbody details since 1) you can't really see it with those deep side sills, and 2) I'm going to fill the underbody area with as much weight as possible. Another reason for taking a break from this kit was to wait for the proper trucks and some screws to arrive. The kit instructions indicate PRR class 2D-F8 50 ton trucks, and the proper ones are made by Kadee (item #517). The only downside is that they come with the NMRA standard .110" treadwidth wheels. I'll eventually change these out for Code 88 "scale" wheels. I also wanted to get some of the KD plastic 2-56 screws to mount the trucks. While I could have used a Dremel cut off disk to trim any screw overhang that would interfere with the car floor/deck, I figured plastic screws would be easier to snip and sand flush. Unfortunately, when I test fit the trucks, they interfered with the underbody as well as the sill steps. Fortunately, the car also looked like it was sitting a bit low. The solution was easy - just add a shim to the bolster to raise the carbody off the truck. In this case, I used a piece of .042" thick styrene strip, drilled a clearance hole with a #43 bit, and ACC'd it in place. Here you see what I meant about the screw coming up too far through the frame. Since it's plastic, it was easy to trim it to precisely the proper length. Snip the excess with flush-cutters . . .
Then sand down to flush. Next, I installed KD #158 couplers ("scale" head, whiskered) with the "trip hoses" snipped off, per my usual practice. The coupler box cover that comes with the kit snaps securely in place. If/when it ever fails, I'll snip off the lug and drill/tap for a screw rather than snapping it in. Turns out, just adding the .042" shim on the bolster solved a bunch of problems: no more interference with the underbody or details, and the couplers are at exactly the correct height. #FTW! So now that I know everything fits and will work, the next step is to remove the trucks & couplers and wash the completed carbody/frame and deck/floor to prep for painting. F&C recommends either Dawn grease-cutting dish soap or Shout, so I picked up both at the grocery store last weekend and will clean everything up as soon as the glue's all cured. Looks like I may be painting this weekend! 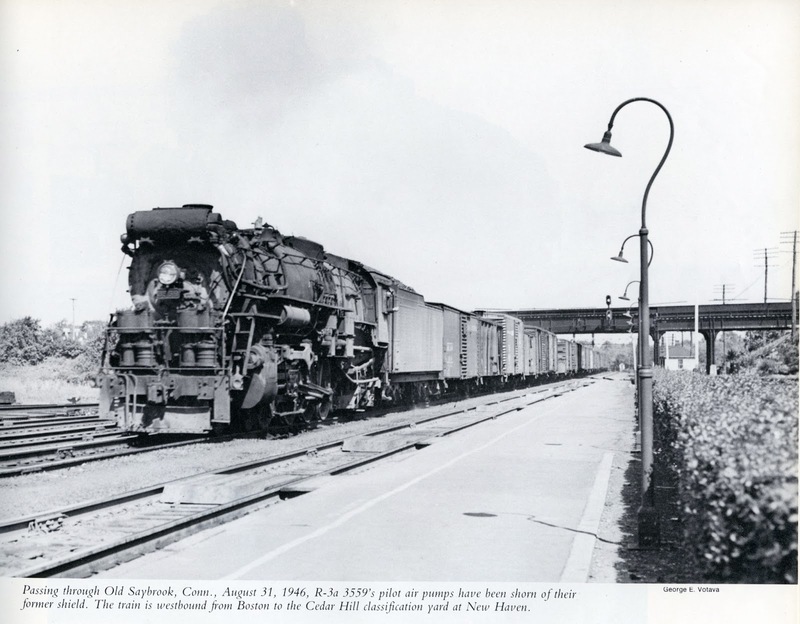 Long-time readers know that the major rail-served industry at the south end of Wethersfield during the late 1940s is Valley Coal, located at Wells Road and the Silas Deane Highway. This is a view of the Sanborn map, oriented as you'll see it on the layout (the aisle would be at the bottom of the image). And here's an admittedly poor aerial view of the prototype, shot looking east/northeast. This is a zoomed-in view of a photo taken after the 1938 hurricane. These damage photos are actually great resources in that they're often the only perspective view you ever get of a particular area. In the photo above, you can barely make out the Valley Line near the top of the pic, going from upper left corner down toward the right. The siding is located between the oil tanks and the mainline. You can also barely make out the vertical coal hoist, and assorted sheds and bins. Like many retail home heating fuel companies during this era, Valley Coal offered both coal and oil for local customers - but as far as I know, despite eventually being 100% an oil dealer (and even selling gasoline), it was always known as "Valley Coal." I've posted separately about the amazing model of the Valley Coal office, just outside the picture on the right, that Dave Messer built. For all my posts related to modeling Valley Coal, click here. Well, Dave's participation in the Valley Coal project continues with the construction of the oil tanks - and I just got the completed model last Saturday. Unfortunately, despite prominent labels marked FRAGILE the USPS did it's level best to destroy it. Fortunately, they didn't succeed - but there was still a little work to do. Once I unpacked the box, the above is what I had to work with. I later found a few more details (I'm glad I saved the box!). So it was like receiving a really amazing kit - that was already 98% finished! All I had to do was confirm with Dave where everything was supposed to go, then I used my new favorite glue (Aleene's Fast Grab Tacky Glue), applied with a toothpick, to attach all the pieces. It took a couple of consecutive evenings since I couldn't glue everything back together at the same time - I had to go in substeps, letting some things cure before being able to attach additional things to it (e.g. installing a tank before attaching the platform). But I really enjoyed being able to "participate" in the construction, even if only incidentally and in a very minor way. The best part was being able to appreciate all the fine detail Dave included in this scratchbuilt industry. Looks amazing and another example of Dave's craftsmanship. Sharp eyes will note that the "tank farm" is selectively compressed - 3x2 tanks rather than 5x2 - but I bet if I hadn't pointed that out you wouldn't have noticed. Bottom line is that it's going to be perfect in the Valley Coal scene I'm building. One last thing I decided to go ahead and add was hoses to the ends of the pipes. I'd been using 3/64" heat shrink tubing during my recent decoder installs, so I got the idea to use those to represent hoses. Fun Fact: 3/64" tubing slips nicely over the end of the wire that Dave used to represent the pipes. I only needed a daub of tacky glue to make sure they wouldn't slip off. But first, I dipped the ends into some silver/gray paint to represent nozzles at the end of the hoses. Turns out that the hoses will mostly be on the back side - facing the backdrop and away from the aisle - so I didn't have to worry too much about superdetailing the hoses. Just having them at all will do the trick I think. Compare to the prototype map and photo and I think you'll agree that Dave nailed it! Can't wait to get this scene finished and continue progress north into Wethersfield proper. Hope you'll continue coming along for the ride! All heady from my first decoder install (despite the poor running result, which is likely the result of a poor mechanism rather than my installation), and having built some confidence in my soldering ability, I decided to tackle a harder project (harder since I had no sample to use as a guide) - converting an old Frateschi New Haven Alco FA-1, imported from Brazil by E-R Models back in the late 80's/early 90s. Apparently, "they used to produce US product for Atlas until Atlas took the work to China" so I figured it'd be a good candidate for conversion. This model isn't Atlas/Kato smooth, but it runs really well considering its vintage. Yes, this time I tested it thoroughly on DC before starting the conversion. Besides, I need some more road freight diesels for the Shore Line. Very old school - the "PCB" is really just a way to save wiring, I suppose. There's nothing on there but traces for the wires to solder to. Unfortunately, the motor terminals are soldered directly to this board. Removing the wires was easy enough - just touch the iron to the solder and pull the wire - but disconnecting the board from the motor required desoldering braid to remove all the solder and free the board. Took some effort, but I was finally able to remove it. Before removing all the wires, I had noted which motor terminal was connected to which side of the track pickup/trucks. On this model, it ended up being counter-intuitive: the right motor terminal, which would normally connect to the right/red side of the trucks and be attached to the orange wire from the decoder, actually connected the left side. And vice-versa. So to keep things straight, I used a Sharpie to mark that this terminal required the gray decoder wire rather than the orange. Gray wire successfully soldered and insulated from its surroundings with a piece of shrink tube. (Un? )Fortunately, things progressed very quickly from this point on as I briskly fluxed/tinned/soldered connections to get things finished much more quickly than my previous install. So I didn't take any more pictures until I was about finished. What I did though was make a styrene mounting board like I did for the DL-109. This one was fashioned as a replacement for the PCB I'd removed, using .060" thick styrene, cut to .485" wide (to slide through the existing mounts above the motor) and 3.25" long (to provide enough support for the decoder and speaker, while not going into the cab area). Double-sided foam tape and Kapton tape completed the installation - well, except for the headlight. Speaking of the headlight.... I used a 3mm clear white LED with a 1k resistor soldered on the cathode (- side of the LED). I would really have rather used a "warm white" or "sunny white" LED for a warmer, less bright white tone, but my local shop didn't have any. If you have any recommendations for what you'd use, please let me know! Fortunately, the brightness of the LED can be adjusted on the ESU decoder and I dialed mine back to a level 10 (from a default value of 31). That toned the brightness down to an acceptable level, but it's still very white. If I find LEDs that look more like the "Golden Glow" headlights I've seen in color photos of New Haven diesels, I'll have no problem changing them all out. The hard work is already done. Here's a shot of the completed installation, with the headlight installed. And a closeup, showing the resistor, twisted headlight leads, and shrink tubing to keep everything isolated. You'll also notice that I cut back the LED leads quite a bit, opting for wire rather than the stiff leads for easier clearance. This time I opted to place the resistor further away from the decoder, at the risk of it showing in the cab. I don't know how much heat the resistor will give off - and the decoder produces heat too - so I figured separating them would be a good idea. Things apparently were going All Too Well though - so Mr. Murphy decided to give my smugness a little slap. As I was attempting to put the shell back on the second locomotive, I managed to break off the rear coupler mount! So here's the chassis, supported by two blocks of wood (rather than a foam cradle, which might hurt my decoder wiring), with the broken mount/coupler off to the side. A closeup of the break. I'm going to try using contact cement to repair this, but given the strain/tension that this mount may have to endure hauling long freight trains, I don't know how well that will work or how long it'll last. In the meantime, I'm going to try to find some 1/4" square styrene to fabricate a new mount. All in all though, these decoder installs have been incredibly satisfying. I've succeeded in removing the mystery that had prevented me so long from even trying it - and now I'm, well, not a "veteran" but I certainly know how to do it. And HAVE done it, three times now. I don't know how long it'll take me to attempt an install on an old brass steam locomotive, but I'm fairly confident now that I can take care of most diesel installs. And that's a pretty cool place to be. Hopefully my story will encourage some of you to give it a try - and if you do, be sure to let us know so we can cheer you on!